This blog is a bit longer than usual, and a little more science focused than usual. Its aimed to help you understand where the talk about fat and health comes from, and where the field is moving. The question I hear most often when introducing audiences to low carb high fat (LCHF) or Paleo concepts is some variant of “aren’t you worried about all that fat?” The idea that fat is fattening is the easy one to address, plenty of people have lost weight publically on high-fat diets, the fattening carbohydrate was never really forgotten, and contrary ideas have a degree of attractiveness. The question of cholesterol and heart disease, or other diseases presumably involving lifelong processes that are mysterious to the average person and far from clear to scientists), is a harder one to answer. My purpose here is not to answer it conclusively, but to place it in context. There are four basic positions when it comes to dietary saturated fat, cholesterol, and animal fat as dietary risk factors (note that I include dietary cholesterol). The classic view, developed by Ancel Keys and promoted widely, is that these dietary risk factors (DRF) promote the development of coronary heart disease, and that replacing them with other foods – mainly carbohydrate and polyunsaturated vegetable fat, but also some additional fibre and long-chain omega 3s (it is arguable that neither of these latter two actually supplies enough energy to be taken seriously as a “substitution”, being rather in the nature of “supplements”) – reduces this risk. A secondary assumption often tacked onto the classic view in popular science writing, and which had some official backing until recently, is that the DRFs play a role in other diseases, such as cancers. The first claim is supported by extreme epidemiological studies involving populations such as vegetarians who sedulously avoid the DRF, and have lower incidence of CHD. However these same populations have higher rates of non-CHD mortality, contradicting the secondary assumption. Avoiding the DRF is not “good for you” but seems to trade one type of disease risk for a raft of others. The contrary view, held by the cholesterol skeptics, is that there is no causal link between the DRF and CHD. This is supported by a wide range of evidence that contains findings contradictory to the classic view. Meta-analyses of saturated and polyunsaturated fat consumption within standard dietary patterns (as opposed to the extreme DRF avoidance patterns supportive of the classic theory) do not support the link. Controlled trials (RCTs) in which polyunsaturated fats or carbohydrate replace saturated fats do not produce strong or consistent benefits and sometimes produce increased harms in terms of both CHD and other causes of mortality. The Paleo view is that the DRF are not risk factors in the context of an evolutionarily appropriate diet and lifestyle (lifestyle aspects include sleep and other aspects of circadian rhythm, exercise, avoidance of environmental risk factors, healthy gut bacteria, and intermittent fasting); that the studies supporting the classic view are confounded by inclusion of trans fats, processed meats, and refined carbohydrates. This is supported by the logic of evolutionary theory and a wide range of circumstantial evidence; for example that traditional cultures do not experience the DRF as risk factors for any disease, but do so experience modern foods – sugars, refined starches, and vegetable oils. Is there common ground between the opposing views? All these views have some supportive evidence, and when this evidence is viewed in detail they are not completely incompatible. At a time when the classic view is, generally with good reason, coming under sustained attack among the scientific community, and is rapidly losing support among the public, it is prudent to remember that there are likely to be babies floating in its dirty bathwater – observations that will remain true under any paradigm, which still beg for explanations, and which may point the way to new truths. For example, in epidemiology correlating DRF with CHD there is an exception in that dairy fat, which is rich in the DRF, has protective associations with CHD. This is consistent with the so-called French Paradox, wherein France has relatively low rates of CHD yet the world’s highest butter consumption per capita, as well as an appetite for other fatty dairy foods; when Ancel Keys collected evidence to support his hypothesis, that saturated fat consumption was linked to heart disease, American butter consumption only contributed 4.8% of that nation’s total fat intake. At the other extreme, processed meat products are the high-DRF foods with the strongest correlations with disease. Similarly, nuts are rich in polyunsaturated fats, and nut consumption is associated with health benefits (reductions in both CHD and non-CHD mortality) not seen with polyunsaturated oils. This difference between nuts and polyunsaturated vegetable oils is particularly striking in the epidemiology of the eye disease age-related macular degeneration (AMD). These examples illustrate why attempts to influence disease risk by replacing animal fat with vegetable fat (for example, in commercial deep fryers, in shortenings, and in the spreads used on breads) have not produced the benefits Ancel Keys predicted (to put it mildly). The DRF – dietary cholesterol, saturated fat, and animal fat – are also protective factors, especially when associated with nutrient-dense unprocessed foods; and the polyunsaturated oils, which look like protective factors in the context of evolutionarily appropriate foods such as nuts, become DRF when isolated; in much the same way as high intakes of some vitamins, once removed from the foods that supply them, do not produce benefits and begin to be associated with harm. Risk of disease, both CHD and non-CHD, can be also predicted by metabolic risk factors not directly influenced by the classic DRF in the way that serum cholesterol is said to be – blood pressure, blood glucose, fasting triglyceride, CRP, body fat %, and so on. These are the markers that improve when carbohydrate is restricted (and when fatty fish is consumed) but that tend to worsen or stay the same when animal fat is replaced with carbohydrate or vegetable oil. They are also improved by exercise and the other lifestyle adjustments of the Paleo approach. The impact of even moderate exercise on heart attack risk dwarfs the benefits claimed for replacing saturated fat with polyunsaturated fat by those basing their predictions on the lipid hypothesis. In which case, it is worth asking, what stops people at risk from exercising? This will often turn out to be factors such as pain and fatigue – inflammatory and metabolic symptoms which are reliably reduced by carbohydrate restriction, and which may be exacerbated by high intakes of omega 6 PUFA. The rationale behind the low-carbohydrate Mediterranean diet. It sometimes happens – reportedly in about 20% of cases – that LDL cholesterol rises significantly on a low-carb paleo diet rich in DRF, even as all the other risk markers improve. Whether or not this is significant in terms of long term risk of CHD (primary prevention), which is debatable, it is not seen as desirable in the management of pre-existing CHD (secondary prevention) or in high-risk patients (those with family history of CHD or with established medical conditions that increase risk). Best practice in these cases currently seems to be a carbohydrate-restricted version of the dietary pattern invented by Ancel Keys, liberalised to contain sufficient of the DRF to maintain health. For example, cardiologist Aseem Malhotra, who famously wrote that “saturated fat is not the major issue” in the British Medical Journal, and who is skeptical about the benefits of cholesterol-lowering statins for primary prevention of CHD, recommends a low-carbohydrate Mediterranean diet that includes full-fat dairy, and excludes oils other than olive oil. (The various Mediterranean Diets seem to resemble what Mediterranean peoples actually ate in much the same way as the various Paleolithic Diets resemble what Paleolithic peoples actually ate). Whether this partial restriction of red meat and higher wholefood PUFA intake is necessary for secondary prevention in the context of a low-carb diet, it seems to be the “best guess” available from reading the epidemiology available around non-carbohydrate restricted diets. It involves a “hedging of bets” that balances the relative risks of CHD and non-CHD deaths in secondary prevention cases. Why are DRF both risk factors and protective factors? Animal fat, dietary cholesterol and saturated fat, as well as red meat, tend to be associated together (vegetable fats can be highly saturated, but never contain cholesterol). 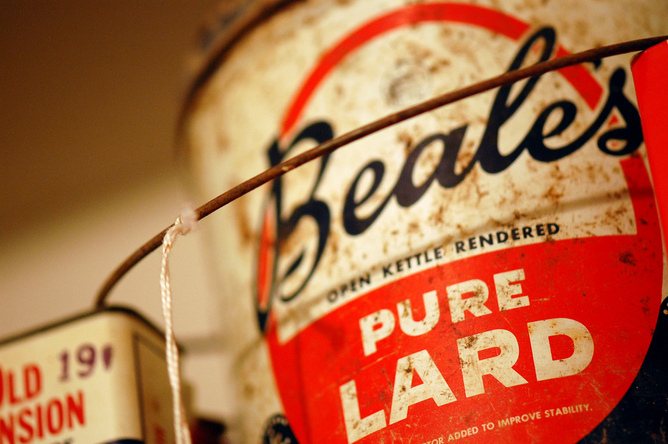 Animal fats can also contain large amounts of PUFA, which, like cholesterol, can be oxidised or otherwise adversely affected by heat. Red meat also forms carcinogenic heterocyclic amines (HCA) when scorched. Meat, especially cheaper meats like pork, is subject to processing in various ways that deplete its nutritional value, denature its lipids and proteins, and add unwanted non-food chemicals of unknown safety. The ways in which livestock is fed and medicated can also affect the health of consumers, and animals (especially pork) can carry parasites able to infect humans. For this reason many meat products (unlike dairy products) need to be well-cooked before consumption. The high heme iron content of red meat is another possible risk factor, but is also a protective factor, depending on one’s iron status. If these considerations are valid, then clearly the best way to include meat in the diet is to source high quality unprocessed meats from pasture-fed animals, mainly ruminants, and as much as possible cook it at lower temperatures (for example, in soups and stews) or for shorter times (as with steak). Fatty animal foods are the only source of retinol and vitamin D3, and the main source of vitamin K2 in the diet. These are vitamins that play important roles in maintaining healthy blood vessels. They are also (ruminant fats including dairy) sources of rumenic acid, the main isomer of conjugated linoleic acid (CLA), a naturally-occurring trans fatty acid which can perhaps best be characterised as analogous in its anti-inflammatory, anti-atherogenic and fat-burning effects to omega-3 fats. The anti-diabetic effect of CLA in clarified butter (ghee) in the Indian diet may be responsible for health benefits which have been lost with that subcontinent’s modern switch to low-fat, high-PUFA diets. Ruminant meat fat from pasture-fed animals is also a source of DHA. Fatty animal foods, especially those richest in cholesterol, are also the main dietary source of choline, which is removed from vegetable oils, and which is essential for the prevention of fatty liver disease, a precursor of both cirrhosis and diabetes. Dietary cholesterol and individual saturated fatty acids may by themselves have protective effects in specific cases, for example this is well-documented in alcoholic liver disease. Red meat is also an important source of zinc and iron. The argument is that saturated fats are thus a relatively neutral source of energy in health terms, as meta-analysis suggests, but may in individual studies have been sometimes damned, sometimes blessed, by the company they keep – that is, by their association with many other factors that are not usually taken into account by epidemiologists, such as cooking and food processing methods, additive or micronutrient content, lifestyle choices, and so on. While some perceptions of the LCHF diet include large amounts of added cream, butter, extra virgin olive oil and coconut oil, this is not always the case, because many wholefoods that are suitable for LCHF diets are intrinsically high in fat, e.g. nuts, salmon, avocado, coconut, lamb and other meats, eggs, cheeses, olives. These foods are rich sources of protein, vitamins, and minerals and it is possible for many people – those with low bodyweight or low energy requirements – to be well nourished without ever eating added fats in amounts greater than the relatively small amounts needed in cooking, or to dress vegetables. Added fats provide what are called discretionary calories – the extra energy that someone needs after the core nutritional requirements of the body have been realised. This can be a relatively small amount of energy, even if one is trying to maintain a high fat-to-carbohydrate ratio, and in many cases is easily supplied by wholefoods, while those with larger frames or greater energy outputs can benefit from the energy density and high digestibility of added fats. This often appears as a gender difference, with women having less need for added fats to maintain a LCHF or even a ketogenic diet. Sometimes added fats are consumed for medicinal as well as nutritional reasons; the neuroprotective effects of coconut oil, the gut-healing effects of coconut, butter or ruminant fats, or the cardioprotective effects of olive oil polyphenols may be given as reasons for preferring specific fats. The vitamin E content of wholefood vegetable fats, e.g. nuts, seeds, avocadoes and olives, supplements the low vitamin E concentrations in animal fats, which by themselves are unlikely to supply optimal levels of this vitamin for everyone. How much fat do you need to eat on a LCHF diet? Persons eating a modern diet of processed and takeaway food, high in refined carbohydrates, are often unaware of the high fat content of such a diet, because fat is hidden in foods not usually considered fatty (such as bread) and because polyunsaturated vegetable fats are not perceived as being as greasy, satiating, or nourishing as the more saturated animal fats. Because a primary benefit of LCHF diets is an improvement in appetite control, due to greater satiety from the current meals and easier ability to access the energy already stored in the body from previous meals, any increase in fat intake is often small in terms of real amounts eaten, and can be offset by an improvement in the quality of fat and its nutritional content. An exception is the case of athletes with high energy requirements who trade high carbohydrate intakes for high fat intakes on LCHF diets. Athletes are highly aware of their fitness, and follow LCHF diets either because their fitness and performance improves, or because other aspects of health improve, and fitness and performance do not suffer. LCHF, and Paleo, are nutritional principles, or templates, that can be used in the design of diets, and are not absolutely rigid prescriptions. The key is adaptability; dietary needs can change over time, and the ability to adjust and vary the amounts and types of foods eaten on a LCHF diet, including the amounts, types, and sources of fat and carbohydrate, provides a form of nutritional insurance, if such is needed. Progression of age-related macular degeneration: association with dietary fat, transunsaturated fat, nuts, and fish intake. Seddon, J.M. et al. Arch Ophthalmol. 2003 Dec;121(12):1728-37. See, for example, the Low-Carb Mediterranean Diet designed for diabetics by Dr Steven Parker M.D. Vitamins D and K as pleiotropic nutrients: clinical importance to the skeletal and cardiovascular systems and preliminary evidence for synergy. Kidd, P.M. Altern Med Rev. 2010 Sep;15(3):199-222. Significance of the N-6/N-3 Ratio for Insulin Action in Diabetes. Raheja B.S. Ann N Y Acad Sci. 1993 Jun 14;683:258-71. Nutrient Intake of Subjects on Low Carbohydrate Diet Used in Treatment of Obesity. Stock, A.L. and Yudkin, J.
red meat contains a lot of cholesterol. It is lower in poultry foods good for lowering cholesterol , but even more fish. I have been successfully following LCHF now for almost 10 months and have lost 18kg. I enjoyed listening to Phinney last week, and ahould have asked him this question. My question is this: we all know how harmful carbs & especially sugars are. We also know that a diet high in fat is far more satiating, hence, possibly smaller meals, and meals dropped quite easily. What happens to the fat & protein in the diet, if in excess of actual bodily demands from day to day. If we blow out on the eggs and bacon, where does the excess fat go to? Does it get laid down in adipose tissue, is it temporarily stored, or in what way is it handled differently to a “normal” high carb meal? Sure, normal carb meals see the conversion directly to fat in the body, once glycogen stores are full. This point intrigues me, as, although a doctor myself, I do not know the answer, and cannot recall Tim Noakes or Grant answering this before? Many thanks in advance for helping me on this one!